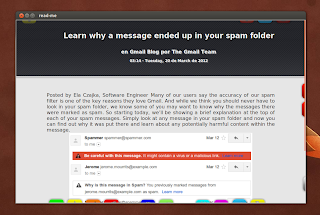 Read-Me is a Google Reader desktop application that doesn't come with many features and instead, it tries to improve the readability. The application features an interesting interface with partially hidden javasacript buttons that show up on hover (they can be completely hidden by clicking the top left button) and it also incorporates some of the Google Reader web interface features: you can share articles on Twitter, Read it Later or by email, it uses the same keyboard shortcuts (j to go to the next item, k for the previous item, etc.) and more. One thing that I'd really like to see in Read-me is offline support. This feature would make it a lot more useful, at least for me, as I'd be able to use it while travelling. Another missing feature is the lack of support for selecting a folder or a single feed to read. 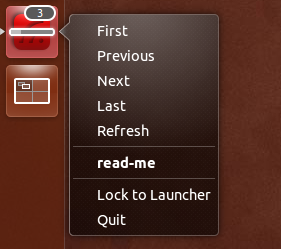 In the future, Lorenzo, the Read-Me developer, plans to add Ubuntu Messaging menu support so you can easily see new unread item titles while the application runs in the background and can easily be opened from the Messaging menu. Ubuntu Messaging Menu will also be supported by Google Reader Indicator, which will later on be completely incorporated into Read-Me. Then you can manually download and install the Precise Read-Me .deb in Oneiric. To use Read-Me simply enter your username and password and all your unread Google Reader items will show up in the application so you can start reading them immediately.